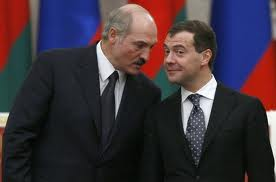 BelarusDigest > Myths > Is Lukashenka the Kremlin’s “loyal satrap”? Is Lukashenka the Kremlin’s “loyal satrap”? Lukashenka has been trying to build the reputation of a loyal ally of Russia to secure the Kremlin's political and economic support. However, his main goal appears to be remaining in control of the situation in Belarus. Compared to Europe or the United States, Russia is more willing to turn a blind eye to human rights violations, is less concerned about democracy and is occasionally willing to subsidise the Belarusian economy. The dwindling of direct and indirect subsidies from Russia has cooled down Lukashenka's pro-Russian rhetoric. The war in Ukraine has further weakened his loyalty. First, Lukashenka criticised the annexation of Crimea. Then he refused to join Russia in trade war against Ukraine. In October 2014 Lukashenka said he was not afraid of Russia's territorial claims and jokingly reminded Putin that some lands in today's Russia had belonged to Belarus in the past. At the same time, the president continues to repeat that Minsk and Moscow need to stand together in times of crisis.